In light of an increase in American unemployment rates and government spending, Massachusetts Democrat Elizabeth Warren has purposed a new wealth tax on the so-called ultra-rich. With a massive amount of partisan controversy building around the legislation, as well as the uncertainty of the contents of the proposal, it is important that we understand both the tax and its characteristics. What is this new proposal? This new wealth tax plan was purposed and pioneered by Warren as part of her bid for President in 2020. She developed the in order to free up more money to circulate through the tax system and economy, both of which have been strained by unemployment and by increasing control of American wealth by a select few, according to Barron’s. 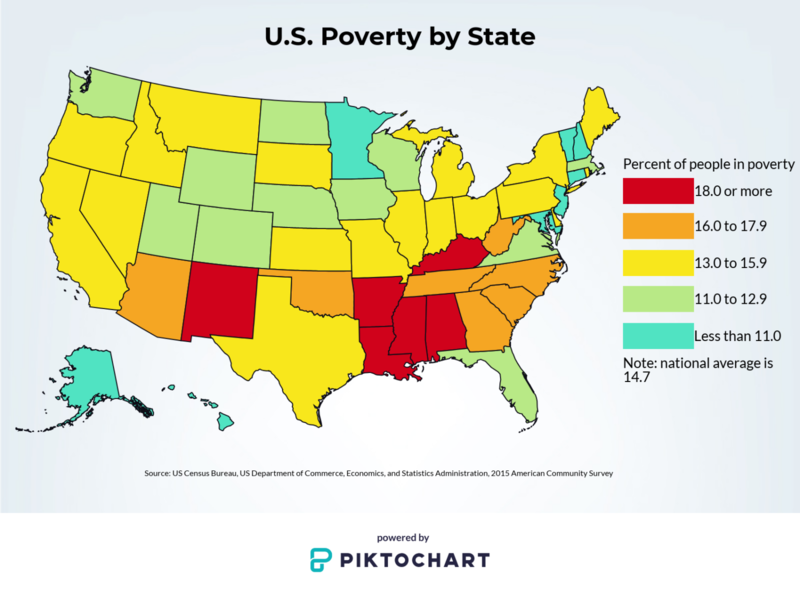 U.S. poverty rates by state. (Billy Mykel/ The Talon News). 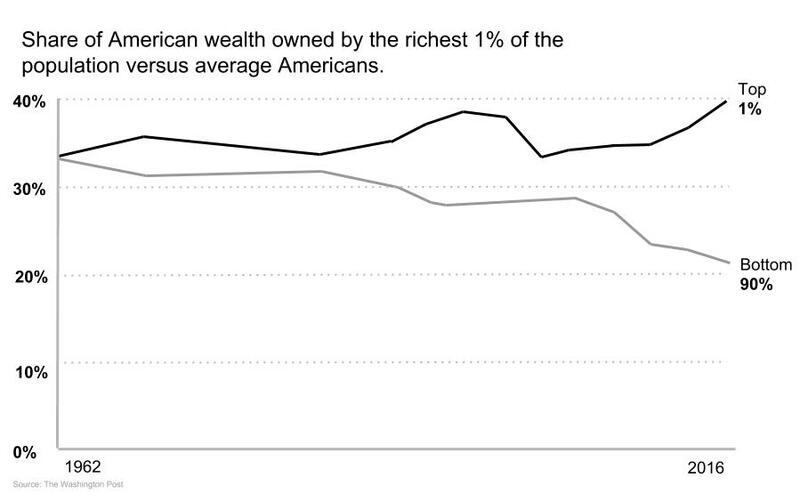 Comparing ownership of American wealth. (Billy Mykel/ The Talon News). This tax aims to reach the “ultra-rich” Americans that control a vast amount of America’s economic value by taxing a person’s acquired wealth as well as income. Unlike a traditional income tax, this wealth tax would also include fluid assets such as property, jewelry, yachts, cars, etc. in order to more effectively gauge a person’s monetary worth. After calculating the worth of a person’s possessions and their annual income after other taxes, the purposed tax would cover any net-wealth that is greater than $50 million, which would be taxed at 2 percent, and any wealth greater than $1 billion, which would be taxed at 3 percent. These additional rates of taxes do not cover wealth before the marker and do not accumulate. 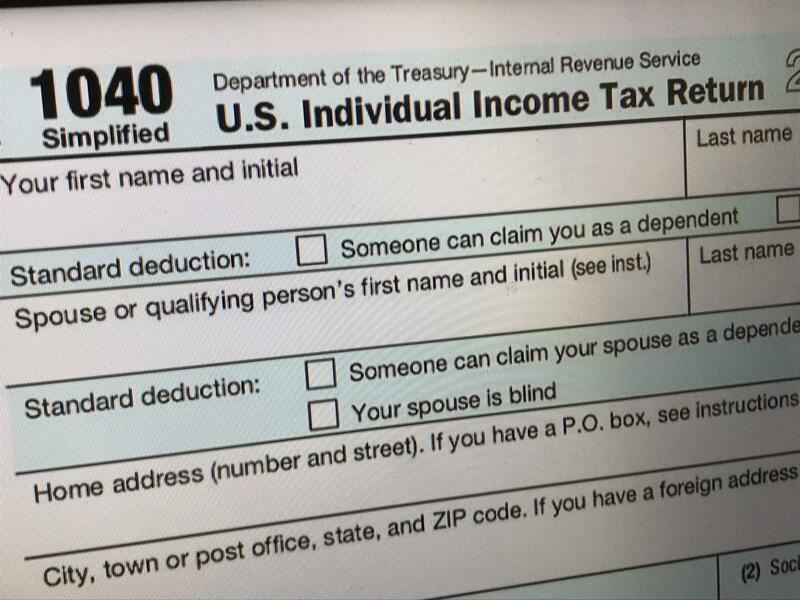 This means that a person with a net wealth of $50,000,001 would not pay a 2 percent tax on $50,000,001, but instead on the $1 over the marker, while a person with a net wealth over $50 million would only pay 2% on their wealth above $50 million and at/below $1 billion, and only a 3% tax on any wealth over $1 billion. This means that billionaire and second richest man alive, Bill Gates, would only pay traditional taxes on his first $50 million, followed by a 2% tax on his second $50 million, and a 3% tax on his remaining $96.8 billion out of his net wealth of $97.8 billion, according to Business Insider. What are the benefits of this proposal? This purposed tax has several beneficial effects, with the most obvious being that it is helping to decrease the wealth gap here in America. This tax was crafted specifically to only tax the richest of the rich, and this is evident because of the fact that the minimum net wealth needed for the tax to apply to someone is over twice the average net wealth of the top .01% of wealthy Americans. 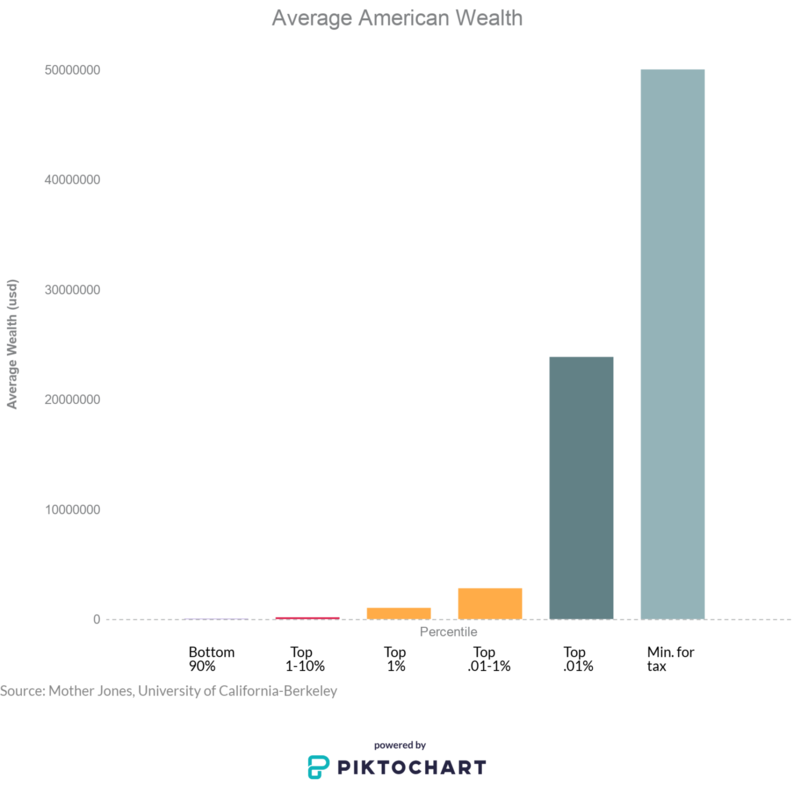 Comparing the average values of American wealth to the wealth tax. (Billy Mykel/ The Talon News). The money gained from this tax could be put towards public interest projects and programs, helping to repair roads and infrastructure, build schools, and combat homelessness. With such an exorbitant increase in tax revenue, the federal government could do so much more to help Americans, whether that means increasing public spending or cutting taxes for the average American. Beyond just the benefit that comes from the tax itself, by doing this we would be adding more fluid wealth into the economy. According to the Prospect, this typically leads to stronger economic growth as well as an increase in household spending power. What are the problems with this tax? One of the biggest problems with this proposed tax, that is being highlighted by many politicians, is that it could overly tax people who can’t afford it. This wealth tax will be paid annually like a traditional tax, but the problem is that wealth isn’t a perpetually increasing thing like income. While an income tax is taken out of a paycheck, a wealth tax takes money from static capital that isn’t earned yearly. As wealth is acquired over time, a person could be paying extraordinary amounts of money for a house they bought once. This means that after earning $1,000, a person whose wealth falls under this tax would not only pay income taxes on it but after buying something with it would pay the wealth tax on it perpetually, until they got lost it or sold it. This is also a problem because it means that people who have more modest incomes and inherit larger estates could wind up paying more in taxes than they earn. One way to visualize this is a pawn shop. A small pawn shop could own $500,000 in merchandise but only earn $50,000. If this pawn shop were to be taxed based on its net wealth or the $550,000 it owns in total at 2%, then it would be paying $11,000, or over 1/5 of its income, on this wealth tax alone. While this tax would never affect average people or businesses, it could greatly hurt the richer Americans whose possessions or inheritance is greater than their income. How do taxes like this usually perform? Wealth taxes around the world have yielded different results, but more often than not are dropped on the national level. A good example of a nation that found itself hurting from a wealth tax is France. France has adopted over five different wealth taxes in recent history, all of which have been dropped after they began to see hits to the economy and job losses as wealthy individuals left the country. France is one of many countries that has tried to tax a person’s wealth only to give up, but these countries aren’t the only ones who have tried. India, which is one of the fastest growing economies in the world, has a comprehensive wealth tax that has been instated for years now and has largely shown benefits, though its version taxes more than just the rich and has lower rates. We can also point to working wealth taxes here in America in the form of county property taxes, which have been in effect for years and help to fund our local governments. Though new problems arise here as we would need to factor in already existing taxes that differ greatly between areas as well as the massive budget hits local governments would take if property tax revenue was redirected to the federal government. All in all, every tax is in some form flawed, including Senator Elizabeth Warren’s new wealth tax. What truly matters is that we understand and remain informed about the benefits and problems that surround this proposal so that come November, we know who we support.